Accessories: Pumpkin Pie Satin Ribbon, Designer Buttons - Pumpkin Pie, Rhinestone Square Brad - Green, Stampin Write Markers, Two-Step Bird Punch, Extra Large Oval Punch, Linen Thread, Scallop Edge Border Punch, Stampin Dimensionals and Adhesives. 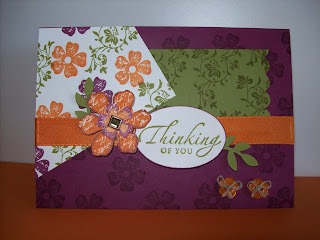 Come on over to Just Us Girls http://justusgirlschallenge.blogspot.com/ and join on in the fun. Nice job with the sketch. I like the DP you chose - it's cheery and bright. You handled the funky snippet of paper in a fun way. I am enjoying watching what gals do with that! Thanks for joining us at Just Us Girls this week. We appreciate your gettin' sketchy with us. Love the colors you've used here! Such a pretty take on the sketch! Thanks so much for playing along with JUGS!! Thanks for sharing your lovely card it look great.